Cookie Dough - A 4-5 week unit using 3.OA and MP skills to solve and justify answers. Rubric and examples of acceptable justification included. The Answer is 36 - Many different questions using 3.OA and MP skills to solve the questions and justify the answers. Examples of acceptable justification is included. Third Grade MARS tasks - These formative performance assessment tasks are from the Mathematics Assessment Resource Service (MARS), a project of UC Berkeley, Michigan State, and the Shell Centre in Nottingham England. 40 questions. These tasks use the old Math standard format but can easily be seen as CCSS standards tasks. Flower Garden - This three part task uses the skill of fractions to solve and justify answers. Fractions on the Number Line - This five part task uses fractions skills to develop an understanding of the structure of fractions within the number system. Mariana�s fractions - This 5 part task using fractions includes the concept of partitioning a number line and thinking about a fraction as an area in addtion to thinking about a fraction as a location on a number line. City Farmers - This 4-5 week unit using 3. MD skills includes rubrics and annotated work examples. School Mural - This two part task using 3. MD skills involves mathematical modeling and mathematical structure as they use the Distributive Property. 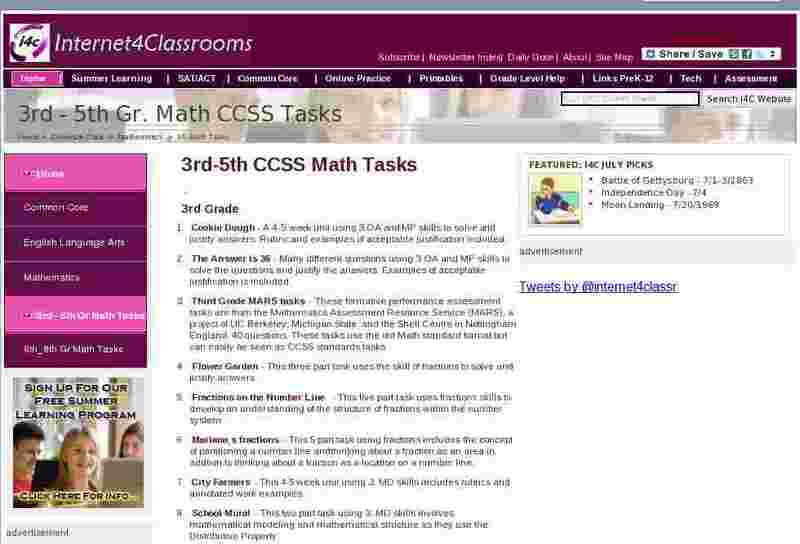 K-5mathteachingresources - 3rd Grade - Tasks for many of the 4th grade standards. Farmer Fred - This 4-week unit helps student in understanding fractional parts of a whole and using fractions and mixed numbers to solve problems. Buses, Vans and Cars - Students must analyze constraints, relationships, and goals to find all possible solutions. NBT and OA standards. Chocolate Bar Fractions - In this 4 week unit, students will show their knowledge of equivalence, ordering, and addition of fractions. NF standards. Deer in the Park - Multistep task using knowledge of�area and perimeter by solving real-world and mathematical problems involving rectangles with a missing side length. OA, NBT and MD standards. Lessons for Learning - E-booklet with multiple tasks for grade 4 using numerous standards per lesson. Leapfrog Fractions - Students will demonstrate the understanding of the concept of equivalent fractions and addition of fractions as joining parts referring to the same whole. OCSD Common Math Assessments - 4th Grade - Tasks for many of the 4th grade standards. K-5mathteachingresources - 4th Grade - Tasks for many of the 4th grade standards. MyBookez - Type in your grade level at the top in the white area and it will find sample tests for your students. Internet4Classroom's Tasks for 5th grade - Find these summative tasks divided by standards. Fifth Grade MARS tasks - These formative performance assessment tasks are from the Mathematics Assessment Resource Service (MARS), a project of UC Berkeley, Michigan State, and the Shell Centre in Nottingham England. These tasks use the old Math format but can easily be seen as CCSS standards tasks. Lessons for Learning - E-booklet with multiple tasks for grade 5 using numerous standards per lesson. OCSD Common Math Assessments - 4th Grade - Tasks for many of the 5th grade standards. K-5mathteachingresources - 5th Grade - Tasks for many of the 4th grade standards. Stuffed with Pizza - Student can use this unit to develop and expand the concept of rational numbers by using several interpretations and different types of physical models.